Ash of Gods features a unique "rogue-like" storytelling style where the story changes based on player actions and reactions, where even the death of important characters won't mean the end of your story! Along with this unique storytelling format, the game offers players an incredible tactical-combat experience, where dozens of character types use unique abilities and synergies, combined with special collectible combat cards, to defeat all comers. A magical soundtrack by renowned composer Adam Skorupa rounds out the offerings of Ash of Gods, making the game one you won't want to miss! Ash of Gods is a ​turn-based RPG featuring constantly evolving storytelling with risks that truly affect gameplay, along with an extensive online PvP mode. 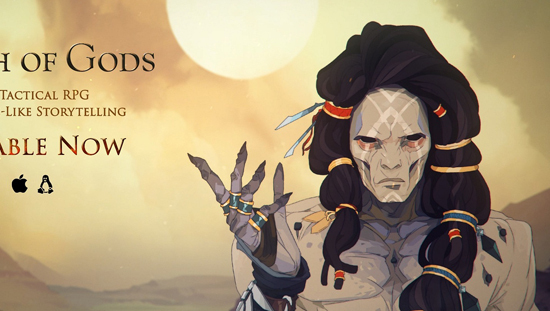 Ash of Gods features a mix of gorgeous art, lush music, tactical combat, and a powerful story that plays out via dialogue driven layer interaction. Ash of Gods. The game is available on Steam and GOG for $24.99 USD. A Digital Deluxe Edition, which includes the base game, a digital art book, printable posters, the Original Soundtrack and more, is also available for $34.99 USD. The deeply layered world of Ash of Gods awaits you. Discover whether or not the choices you make lead you and your team to success or failure.